Asra Shaik, an M.D./Ph.D. student, is the 2018 recipient of the Leonard N. Simons Award for Exemplary Research and Scholarly Achievement. The Wayne State University School of Medicine and Barbara Ann Karmanos Cancer Institute's Cancer Biology Graduate Program held its eighth annual symposium March 23, spotlighting the research accomplishments of the program's Ph.D. and M.D./Ph.D. students, who shared their dissertation projects through six oral presentations presented in the Margherio Family Conference Center, and 18 poster presentations, presented in the Louis Elliman Building. The symposium provides an opportunity for scientific and social discourse between students and faculty. "I appreciate the commitment of the Cancer Biology Graduate Program faculty and students who contributed to the success of this year's annual research symposium," said Program Director Larry Matherly, Ph.D., the Eunice and Milt Ring Endowed Chair for Cancer Research and professor of Pharmacology and of Oncology. "It is the support of our faculty who contribute as judges, instructors and faculty mentors that makes the Cancer Biology Program truly special." M.D./Ph.D. student Asra Shaik received the Leonard N. Simons Award for Exemplary Research and Scholarly Achievement at the event. Shaik is in her fifth year of the Cancer Biology program, and will start her clinical medical degree program later this year. She is mentored by Associate Professor of Oncology Michele Cote, Ph.D., M.P.H. The goal of Shaik's project - "Characterizing novel radiologic and pathologic tissue-based risk factors for breast cancer in African-American women with benign breast disease" - is to find features on mammograms and breast biopsy tissue that predict breast cancer. 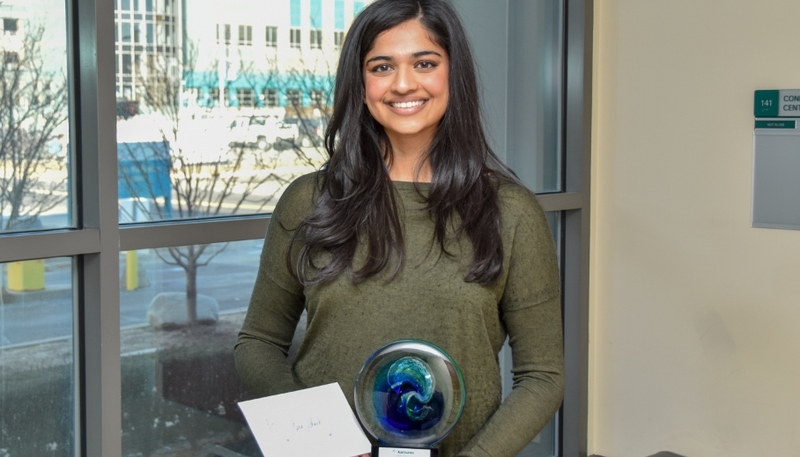 Shaik also holds a F31 Ruth L. Kirschstein National Research Service Award for Individual Predoctoral Fellows from the National Institutes of Health. Simons was an industrious advocate for the community, including 50 years working with the Michigan Cancer Foundation and the Karmanos Cancer Institute. To be nominated for the Simons Award, students must have attained Ph.D. candidacy status and have completed at least two years of study toward the doctoral degree in Cancer Biology.